The United States could save more than 2,000 lives and about $13.6 billion a year by adopting uniformly tough restrictions on teenage drivers in every state, according to a report released Tuesday by the National Safety Council (NSC) and the Allstate Foundation. Officials with those organizations say the report is the first to quantify the extent to which implementing the strictest graduated driver licensing (GDL) laws nationwide could reduce roadway deaths and associated economic costs. The research arrives as federal lawmakers get ready to consider a multiyear reauthorization of highway and infrastructure spending—including legislation that would set aside $44 million over a two-year period to incentivize the establishment of uniform GDL standards in all states. “Our elected officials do not have many opportunities during their careers to take action that will save thousands of lives and billions of dollars in one legislative action. This is one of those times,” Janet Froetscher, the NSC’s president and chief executive officer, said in a news release. Drivers ages 16 to 19 are four times more likely than older motorists to be involved in a crash, according to the Centers for Disease Control and Prevention (CDC). Auto accidents account for 1 in 3 teen deaths nationwide, making them the leading cause of death for that age group. Accidents involving young drivers also rack up billions of dollars in economic costs annually, according to the CDC. And teens’ greater propensity to crash has financial implications even for those lucky enough to avoid causing harm, with auto insurance for teenagers being extremely expensive compared with the prices for other age groups. Safety experts say GDL programs, which delay full licensure until novice motorists get greater experience under low-risk conditions, can drastically reduce those risks. According to the CDC, comprehensive GDL systems are associated with reductions of 38 percent in fatal crashes and 40 percent in nonfatal accidents among 16-year-old drivers. GDL programs exist in all 50 states and the District of Columbia, according to the Insurance Institute for Highway Safety, but the requirements vary widely between states. A bill that was attached earlier this year to the transportation reauthorization package—the Safe Teen And Novice Driver Protection, or STANDUP Act—would establish minimum standards for state GDL systems and tie federal highway-aid funding to those standards. The bill would authorize $22 million annually for two years to train state officials, publish materials about new GDL laws and carry out traffic-safety programs. 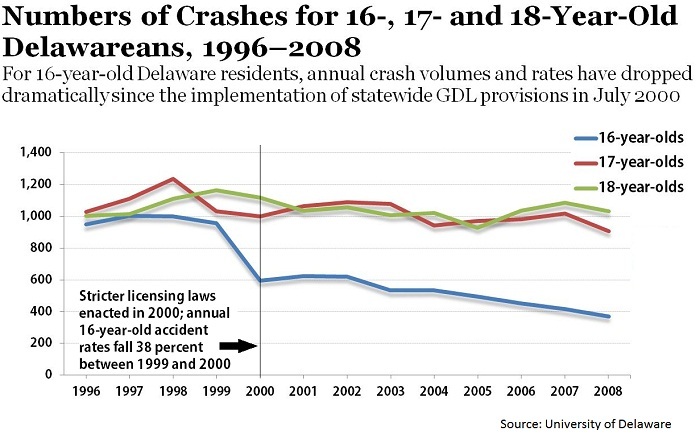 The report’s authors found that states with GDL systems that include at least five of those components have seen 38 percent fewer fatal crashes involving young motorists. The impact of GDL laws diminishes in states that include fewer of those components, according to researchers, but those with only one of those restrictions in place still experienced 4 percent fewer fatalities. The report breaks down by state the projected savings—in both lives and dollar amounts—of adopting the strictest standards. Texas, where 556 people were killed in 2009 in crashes involving young drivers, would see the largest impact, according to researchers, with 211 fewer deaths and $1.44 billion less in economic costs. A report issued last month by the AAA Foundation put the cost of each crash-related fatality nationwide at $6 million and every accident injury at $126,000. Those figures were calculated by assigning monetary value to factors including medical and emergency services, lost earnings and property damage. According to the results of a survey released earlier this year by AAA, 60 percent of Americans support uniform state restrictions on teen drivers.